I hope you find the following questions and answers as interesting as i found the book. In the book you talk about the question of why rather than how we use animals. That seems to be an important perspective in regard to animal rights. When we introduce this perspective do you think it helps to shift the burden of proof in society from people having to justify veganism toward people attempting to justify nonveganism? You touch it with a needle! That is precisely what is needed— a revolution of sociocultural norms. Because humans have consumed meat for hundreds of years, worn animal hides for hundreds of years, etc., these practices are taken for granted as, if not good, at least acceptable. Is genocide acceptable? Is environmental devastation acceptable? Is apartheid acceptable? Those things have been going on for a while, too. On page 67 there is a quote from Joan Dunayer that says observing in silence is to be complicit with the system of exploitation. In regard to this issue, how can we empower people to advocate for non-human animals, and to what extent do some of the large ‘animal rights’ organisations support and encourage people to take a vegan approach to animal advocacy? Well, I think the best way to convince folks to speak up for nonhumans is to lead by example— to do it yourself, and to talk about doing it and why you do it. It’s also important to emphasize that there’s more than one way to “speak up” for nonhumans— it does not have to involve speaking. A lot of vegans I’ve met are somewhat introverted and don’t necessarily love getting up in front of tons of people to speak. While this is an important part of raising awareness and our movement needs some people to do it, there are also myriad other ways to contribute. You can write and help organize conferences and fundraisers, as I do. You can give vegan cooking classes and have mentorship programs in place to help people transition into veganism, as Brenda Sanders is doing in Baltimore with her Vegan Living program. You can write songs about animal liberation, as myriad artists have done and are doing, such as Jah Sun, Historias de Andén, and Illy Rap— and help promote such artists, as Kevin Tillman does via the Vegan Hip Hop Movement. Unfortunately I can’t say much with respect to how nonhuman advocacy organizations are encouraging people to take a vegan approach to advocacy because, frankly, many of them aren’t doing so. Increasingly, mainstream nonhuman advocacy groups are encouraging people to go vegetarian, or reducetarian, meaning they just “cut back” on their meat intake. Vegetarianism violates the rights of cows and other lactating creatures, as well as their orphaned children, while reducetarianism takes the nonhuman animal’s perspective entirely out of the equation and focuses on just one issue: meat consumption. It doesn’t even ask us to stop eating meat (while continuing to consume other nonhuman-derived substances), but only to reduce the amount of flesh we consume. And both of these approaches are only about eating— they do nothing for the nonhumans kept in captivity in zoos, aquariums and circuses, or for those whose bodies are turned into handbags, shoes and other products. Three groups I can think of here in the US who focus on spreading a squarely, unequivocally vegan message are Sistah Vegan Project, Direct Action Everywhere and the Abolitionist Vegan Society. In Australia, there’s also Animal Liberation Victoria. DxE and ALV focus on protests and open rescue and investigation as means of encouraging activists to speak up, while Sistah Vegan Project and the Abolitionist Vegan Society focus on outreach and educational efforts— spreading the facts as far and wide as possible. Sistah Vegan Project is also particularly committed to ensuring that the vegan message is spread while being mindful of the cultural histories of various marginalized groups— something many mainstream nonhuman advocacy groups neglect to consider. On that note, I’ve also recently become involved with Millahcayotl, a food justice organization based in San Francisco, and we are hosting our first annual People’s Harvest Forum in December. While this isn’t an “animal rights” group per se, Millahcayotl is committed to solving problems related to food sovereignty in ways that are free of animal exploitation— human and nonhuman alike. So I think groups like ours are very important in addressing multiple issues at once: justice for nonhumans, justice for farm workers, justice for those living in food swamps, and so forth. I thought the issue of active listening (page 71) is really important, and also the section that followed around maintaining a safe space for people to communicate. Can you talk about the ways we can start to bring critical thinking to issues where people have developed a personal attachment to certain ideas? Well, that’s a pretty loaded question, but I can sure try! One definition or explanation of veganism that really resonates with me is the one Will Tuttle offers in his essay in Circles of Compassion. There’s a line in which he states that we “come to see veganism as boundless inclusiveness.” I really hope I get to meet Will one day so that I can give him a massive hug for that line. It’s important to remember when dealing with people whose opinions differ from ours that they, too, are deserving of compassion— even if they aren’t (yet) exhibiting it to others. This is not only in keeping with my “lead by example” mantra but also, I think, is a more effective form of advocacy than judgment or exclusion: insulting nonvegans, refusing to spend time with them, and so forth. If we hope to change minds, we must engage habitually— and respectfully— with the minds we seek to change, and withhold our judgments as best we can. It helps to also remind ourselves that we weren’t “born vegan”— we, too, engaged in nonhuman exploitation for years before we went vegan, so we should address others the way we would want our former selves to have been addressed. That said, I think just studying up on some of the main points nonvegans bring up time and time again and being prepared to refute them is valuable. First and foremost, veganism is a social justice issue, by which I mean that the most important part of the dialogue is to uphold the victim’s perspective. This trumps all other arguments, as whether or not we “need” meat or “need” to test on nonhumans does not alter the fact that exploiting and murdering them is fundamentally unjust. However, there are certain staple arguments nonvegans love to use, such as the “Circle of Life” argument (Lions eat other animals; therefore, so can I! ), the “health” argument (Protein, though! ), and the “science” argument (We need to test on nonhumans to cure diseases and develop treatments that can save hundreds, THOUSANDS of humans from horrible deaths!). Having logical responses to these at the ready, such as “You are not a lion; humans are actually herbivorous in design,” “There’s plenty of protein in certain plants, and some of the Earth’s most powerful creatures are vegan,” and “We now have myriad alternatives to nonhuman animal testing that are not only just, but yield more accurate results” is useful for reaching those folks who unfortunately just don’t care about justice for nonhumans— those who believe firmly in the Myth of Human Supremacy and are motivated solely by the interests of our species. Finally, we absolutely must be culturally sensitive and intersectional in our activism. We must distinguish, for example, between a motion that brings justice to nonhuman animals— such as the ban on using nonhumans in circuses which exists in many countries around the world— and legislation that discriminates against a marginalized community under the guise of nonhuman liberation, such as banning charreadas (Mexican rodeos) in Arizona while allowing American rodeos to continue. We must avoid using catch-all phrases like “Going vegan is EASY!”, which erase the lived experiences of people living in deserts, tundra, mental institutions, prisons and a host of other places where it is decidedly not easy. Single-issue campaigns (Page 108) are arguably quite controversial when we don’t succeed in drawing attention to the bigger picture of animal exploitation (and a subsequent resolution). Is it perhaps better to draw attention to these issues through protest rather than seeking ‘bans’ or changes in the law, and so the focus could be on seeking a broader shift in thinking. Where we don’t manage to do this are we not complicit in a class-based speciesism? (For example, the elephants at Ringling bros. on page 109) I am interested to know whether this might maintain a species hierarchy? And if it does, how much of an issue might this be? (The SeaWorld orca campaign would be another example of this). I’m hesitant to say that one of these approaches is “better” than the other. Instead, I would argue that both are necessary, and that neither would succeed without the existence of the other. Legislation that protects nonhumans wouldn’t pass unless there was a demonstrated public interest in their passage, which is what happens when people protest, sign petitions and so forth. Likewise, protests would ultimately yield little change if they failed to attract the attention of those who have the power to put legislation on the table. Ultimately, the most important aspects of veganism to me— of creating a vegan society, a vegan world— is shifting our perception of nonhuman animals and, as I said before, revolutionizing the sociocultural norms we have adopted. I do worry that single-issue campaigns reinforce a speciesist hierarchy, as I wrote in this article some years ago as a member of PALS (Phoenix Animal Liberation Squad), but that doesn’t mean that no good can come from them. It doesn’t surprise me that the Nonhuman Rights Project chose as its first species to try to represent in court under habeas corpus, the chimpanzee. Most people already feel compassion for chimpanzees because they are the most “like us.” So that is probably the most likely species to ever get legal representation, but once they get it, I don’t see why NhRP should stop there— and I don’t think they intend to do so. They’re just trying to get their foot in the door, so to speak. For these reasons, the shift in perspective is necessary to see animal liberation realized. We need to get folks thinking about cows, pigs and chickens the way they already think about chimpanzees and dogs— and then, I’d argue, go even beyond that, as even the most avid dog-lovers often assume that humans are more important or “special” than dogs. I don’t personally participate in single-issue campaigns, but for those who do, I think what’s most important is that they consistently frame their campaign within the larger scope of animal liberation. If they only ever speak of one species, then I take issue with that. 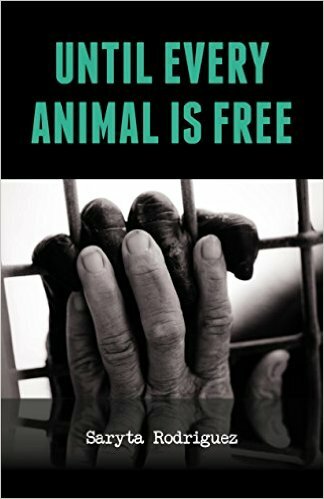 The only reason I mentioned the circus campaign in my book was because of what Mayor Quan said that night at the city council meeting— that she looks forward to the day when all nonhumans will be liberated from the circus industry. Without that, it would have just been a meeting about elephants— not about nonhuman liberation. I really liked the way the formation of The Vegan Society featured in the book (page 174), the history of (contemporary) veganism often seems to be neglected in the mainstream movement. How important is it that we are informed by the origin and development of The Vegan Society when trying to understand the philosophy and practices of veganism? I actually think it is hugely important, as increasingly folks seem to conflate veganism with a plant-based diet. Understanding the history and the original definition reinforces the notion that it is so much more than that: it is a philosophy deeply rooted in nonviolence and justice for all sentient beings. I was really interested by the Ronald Duchin quote (1). I’ve heard claims that people critical of collaborative approaches with industry are actually harming the interests of non-human animals, because welfare campaigns are identified by industry as most problematic to them. In the quote Duchin suggests otherwise; why do you think some vegans continue to believe the animal industrial complex has an interest in speaking the ‘truth’, beyond that which serves their own interest? Is it not the power behind their message in terms of finance and media that maintains their grip on public consciousness; that it is ok to exploit non-human animals? Why would the animal advocacy movement want to get on board with that message? I ask myself these questions every day. It’s really disappointing. Our movement could be so much stronger if our messaging were more cohesive, but when you have efforts like humanewashing (perpetuating the Humane Myth: That there is a “right” way to kill or exploit someone), pescatarianism, vegetarianism, and reducetarianism all conspiring against veganism, the nonhuman animals lose. Veganism is the only nonhuman advocacy option that promises to protect nonhumans to the utmost. Veganic farming in particular helps to protect the nonhumans often harmed by the production of vegan foods (for instance, “vegan” crops grown using fertilizer that results from the waste of “farmed”/enslaved nonhumans). Unfortunately, I always come back to the conclusion that people support these efforts because deep down, they just don’t want to change their lives that much, and these efforts enable people to alleviate some of the guilt they carry upon understanding the harm they are causing, without having to give up very much. It’s easier— for them. This is why the victim’s perspective is so essential; it is the only argument that successfully and immediately evaporates all of these smoke screens. We should not be collaborating with animal abusers, whether their victims are homo sapiens or bovine or porcine or aquatic or avian. These industries don’t need to be reformed— they need to be eradicated. 2. Cultivate the idealists and educate them into becoming realists. This entry was posted in animal liberation and tagged animal liberation, animal rights, saryta rodriguez, vegan. Bookmark the permalink.